In modern design business, we often see how professionals are used to create wireframes to lay out web and mobile sites and applications. Young designers use tons and tons of different digital tools and software, but still seem to struggle with their projects, nothing seems to be helpful or efficient in creating a successful User Experience. I, for one, until a year ago, was always on the quest to find the perfect prototyping app for my design projects, thinking that I could earn time and achieve more doing less. Fortunatly I understood in time that I was wrong. Inkwell has a motto: "Pen before pixel". This movement challenged the agency to get back to it's collective design root and commitment to rapid ideation. By removing high fidelty graphical elements, designers are able to focus only on what is truly important: the user. In the following interview, Kevin Goldman showcases us all the perks of an efficient User Experience Design workflow. I'm Kevin Goldman. I'm one of two founders at 29th Drive. My brother, Gregg Goldman is the other founder. I'm an Industrial Designer turned software designer. My software adventure began in the mid ‘90s in Seattle crafting claymation CD-ROMs. Man, that was fun! I was an indie web and app designer for a long time before founding 29th Drive, Inkwell, and MoreBlu. These days, I live in Scottsdale with my wife and two boys. I'm a Phoenician ... I was born in Phoenix, Arizona, in the United States. What you do and why? I started college as an architect major then switched to the Industrial Design program the day I found out what Industrial Design was all about. An Industrial Design education is one of the best design educations you can get because it's rooted (at most schools) in process not tools or even medium. I fell in love with Industrial Design because the process of Industrial Design resonated with the curiosity I had as a kid. I tinkered a lot. I built things (or tore things apart) to see how they worked and how I could mash them up into interesting combinations. For example, I'd take transistor radios apart and rebuild them to be as integrated into and throughout my bicycle as possible. In a lot of ways I'm still doing what I did when I was 10 years old. The name "UX-Sketching" is a work in progress. We don't like to call what we do just sketching. Besides from the impossible SEO challenge behind the term "sketching", we want to let people know that we're not illustrators or still life painters or sketching noters. Most of what we sketch are akin to wireframes and all the non-visual design work that goes into a software project (the software could be mobile app, a web site, or a desktop app). So ... "UX-Sketching" it is for now. I'm not a big fan of the term UX (user experience) or Product Designer because they get misused so often. Many people use the term UX designer to refer to designers that spend most of their time creating wireframes. UX is more broad. But because there is so much momentum behind UX, we use that term for now. Maybe we'll use it forever. What made you and your team decide to share your thoughts about UX Sketching? About a year ago we started holding "design studios". The design studio format has been around for decades. It comes from Industrial Design. The idea is to bring people from varied disciplines into a safe and non-judgmental setting where they can collaborate and rapidly ideate with the hope and goal of unlocking ideas or innovation that may otherwise not happen within a single mind alone. By the way, design studios are a lot of fun. For our four to six hour Design Studios at 29th Drive, we have a rule that you're not allowed to ideate on a computer. We do this because it's way too slow and limiting on a computer. In the context of a Design Studio three designers—and engineers and business stakeholders—can create dozens or hundreds of unique ideas to a design problem. We all know that we'd get far fewer ideas and less novel ideas during this rapid ideation mode if we used a computer. Not only this, the project team, including the client and business stakeholders walk away from a half day design studio with shared knowledge of the design thinking behind each idea. Said another way, all the people in the Design Studio were design doers for those four hours, not just spectators or reviewers. They all got inside the design in the same way that a band of musicians get inside the music together as they perform. This is all a long winded way of saying that after our team had its first design studio with pen sketching, we never fully went back to design in isolation using software tools. We still use Omnigraffle here and there. But only a fraction of what we used to. Our process is collaborative, iterative, cross disciplinary, and hopeful—in the way that improvisational comedic actors are hopeful that no matter what anyone says or does on stage the story can, will, and must unfold naturally in the best possible way so long as everyone on stage remains in the moment and in tune with the energy of the audience. Our process is also in a state of change most of the time because (a) every project has unique needs and because (b) we're always looking to learn, grow and try new things. You may think that this isn't much of a process if the process is always different. And in some ways that's true. But even within this state of change there are constants. We always meet for 10 minutes in the morning to summarize what we did the previous day and what we're doing today. We always work to empathize deeply with the end user. We always work in a disciplined way to make sure that our communication amongst the team and with our customers is clear, concise, and timely. To elaborate on communication a bit ... we have a fierce rigor in how we communicate. Communication is a huge part of the design process. We take the extra time to accept ownership of ambiguous situations in emails, on phone calls, in legal contracts, etc. so that we can make these situations unambiguous or at least acknowledge what's ambiguous. How do you explain to clients your design process? This is a great question. It's important to set expectations with clients and have well crafted communication with your clients even before the work with the client is approved. We tell clients that we pen sketch and rapid ideate, particularly in the early phases of a project. We let clients know that we may move from a pen sketch to an xcode or HTML prototype or paper prototype so that we can test the designs early and often. We let clients know that we start every project with a kick off meeting and we specifically ask the client for their commitment to give us a recap meeting a week after the project has ended so that we can learn what worked and what did not work. We let clients know in advance that the recap meetings are for us but that our clients tend to get value from them too. We do all this (and a lot more) in our early discovery meetings with potential clients and again in the proposal presentations with the clients. What are the main problems that you encounter when showing sketches to clients? With all the clients we've shown sketches to we have received zero push back from clients regarding the pen sketch format. Clients (everyone) understands a pen sketch. Everyone has created pen sketches themselves at some point in their lives. They know a sketch is not the final design. (To their disappointment clients do confuse digital wireframes with final designs at times.) Clients know that it doesn't make sense to judge fonts and colors in a pen sketch. They know that layout proportions aren't final in a pen sketch. If clients know pen sketches are coming, if they can see them clearly with screen sharing tools, if they can reference them easily because they are well numbered, then clients don't have hang ups with pen sketching. What are your tools of the trade and why do you recommend them? The most important tactic for UX Sketching is to not use pencils. Pencils smear easily. They lack contrast. And, most importantly, pencils have an "undo" feature (the eraser). An important tenant of ours at 29th Drive is to avoid undo features at all costs, no matter if it's an eraser or Command+Z. Any readers out there still using pencils to sketch, trust me, switch to pen. It'll force you to think quickly and critically while sketching. It will make your sketches more daring. And, pens can be layered with design markers and other pen colors without smearing. The second most important tool of the trade is plain blank 8.5x11 printer paper. Don't use grid paper or dot paper or "interface design" paper that has pre-printer browser or mobile viewport outlines. The grid and dot papers make ideas rigid and they add unneeded noise to the sketch, particularly when the sketches are photographed or scanned. Pre-printed boxes and guides just get in the way of the very fast flow you intend to enter when sketching. What can you tell us about Inkwell and your Webinars? We get into the details of UX sketch tools and rapid ideation processes in a free UX Sketch webinar that we host. There's a rich Q&A session at the end of the webinars (we always run long with Q&A). The next webinar is July 16th 2013, you can register here, and we host them once a month. If it's past July 16th 2013 as you're reading this, you can register for any of the webinars on our product site www.inkwell.io. Maybe I should have talked about Inkwell first. We designers spend so much money on software and computer hardware, we thought it'd be fun to design, manufacture, and sell a sketch kit made specifically for designers. So we did just that. We launched Inkwell in March of 2013. Inkwell is a handmade sketch kit created specifically for web and app designers, filled with carefully curated tools and tips. We're selling Inkwells around the world to all kinds of UX/UI designers. The in house designers at Hershey's Chocolates bought Inkwells. Josh Brewer, the lead designer at Twitter bought an Inkwell. Drew Wilson asked us to present Inkwell at his Valiocon earlier this month. The motto of Inkwell is "Pen Before Pixel". It's been a lot of fun to be a tiny tiny part of a movement to get back to our collective design roots and commitment to rapid ideation—even as we design software. We do. We collaborate in real time with our remote clients or designers using the iPevo document camera. We recommend this document camera. We send them to our clients and we use them even when everyone is local and in the same room. 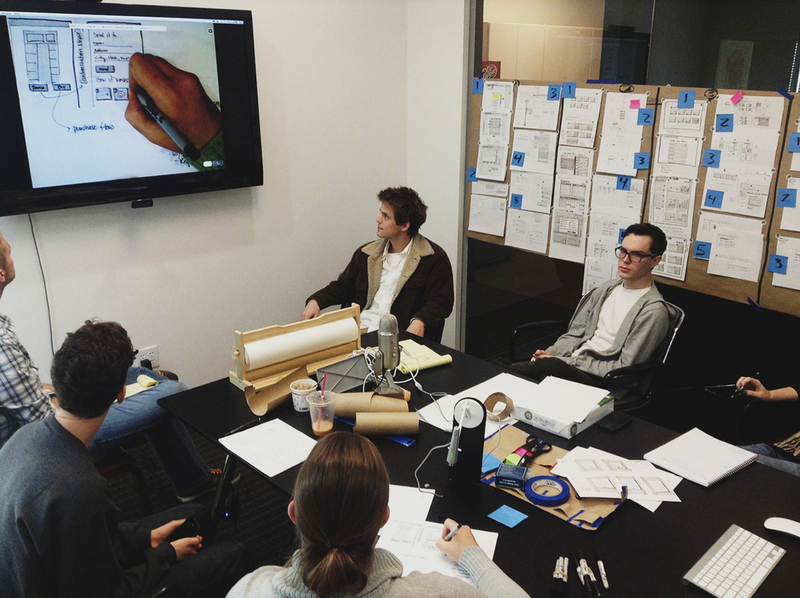 In the photo below, you can see our lead designer, Jen sharing her sketches with others in our conference room. The iPevo saves us from all huddling around Jen's shoulder as she presents her ideas. Tune in to the next Webinar that will take place on July 16th 2013.